Gov. Gretchen Whitmer talks with teachers about her educational goals. Ending years of defunding and under-funding education must be a priority of state government if Michigan is to return to the ranks of high achievement states. So far the new administration in Lansing is sending signals that it is willing to break the pattern of minimizing the importance of schools, and that is a really good thing since the state has sunk to the bottom of states in terms of educational support. Bridge Magazine recently published the educational goals of new Michigan governor Gretchen Whitmer, calling for dramatic policy revisions. "Every student must have the support, tools, and skills they need to compete for high-wage jobs and have full and productive lives," says the new governor. "Students are preparing for jobs that don't even exist today, which means we must teach them how to think critically, to problem solve complex issues and to work as a team. That's what this agenda is all about. Whitmer's "cradle to career" rallying cry calls for respect for educators; reducing over-emphasis on standardized tests, and fixing our broken school funding system. 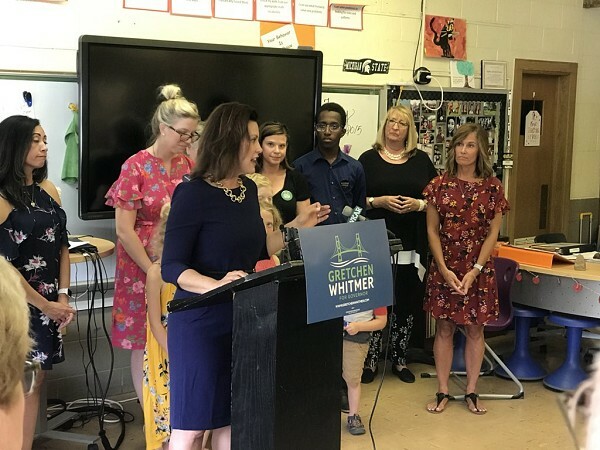 Whitmer proposes universal pre-K for Michigan 4-year-olds, phasing in the expansion over her four-year term as governor by gradually expanding the state's Great Start Readiness Program (GSRP), which now offers full-day pre-K only to children from low- and moderate-income homes. The Democrat's education plan expands services for even the youngest of children, from in-home nurse visits for infants to increased state subsidies and eligibility levels for high-quality child care. She marks the first 1000 days of a child's life, long before they enter kindergarten, as vital to improving Michigan"s school performance. Those types of early services would cost money -- at least $100 million for GSRP expansion alone -- but would likely result in fewer students starting kindergarten behind more affluent classmates and fewer placed in special education, because of the positive impact of catching problems early. Elementary classmates would be exposed to more support staff than currently exist in most schools -- more literacy coaches, counselors and nurses. Whitmer would ban guns in schools for everyone other than trained, licensed law-enforcement officers. In a Whitmer public school system, Michigan's third grade "read or flunk" policy would be revoked. Whitmer says students shouldn't be penalized because adults haven't figure out how to help them read. There would be fewer standardized tests and more reliance instead on school work done over the course of the year. Perhaps the biggest change in schools would be something students might not notice. Whitmer would change Michigan's school funding formula to provide more per-pupil funding for students who are more expensive to teach: English language learners, special education students, and children from low-income households, for example. Under Whitmer, Michigan's third grade "read or flunk" policy would be revoked. Whitmer says students shouldn't be penalized because adults haven't figure out how to help them read. There would be fewer standardized tests and more reliance instead on school work done over the course of the year. Let's watch and see if the rhetoric matches up to action.